What is Osteopathy? Osteopathy is a safe & effective manual therapy Osteopathy is a holistic, complementary therapy which considers the patient as a whole, treating not just the pain but the cause of the symptoms A core principle of Osteopathy treatment is to help your body's own healing mechanisms Osteopathy works on the neuro-musculoskeletal system, primarily on muscles and joints using a variety of manual techniques Osteopathy can help adults, children, the elderly, pregnant women and babies. Most people think that we just "treat" backs and although we see a lot of patients' with this complaint, we also treat many other conditions. If you would like to find out if Osteopathy is able to help with your condition, please ring Liz for an informal chat on 07789 954 058 (no fee or obligation). Liz Walker is a fully qualified Osteopath with a degree from the British School of Osteopathy, gained in 1994. 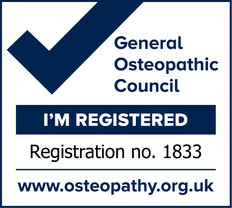 I am trained and operate to the high standards set by the General Osteopathy Council. For more information or a chat about your condition please call me on 07789 954058 or alternatively please complete my short contact form below.